I thought I should take a minute to give an update of how the boat shop is shaping up as we roll into 2019. We have consolidated about 75% of our belongings and assets into 1/3 of the 6000 square foot space we are now calling home. In the North East corner of building 5-5 at 101 Bay Beach Rd. we have a 20x30 hand tool area for meeting and teaching. This is the “shavings” area where there will be very little dust made by power tools. The entire space has a ton of potential and we have a great team working on the design and layout of flooring, light fixtures, and etc.. A big shout out to Steve Srubas for our master plan which includes gorgeous 14’ windows that will be installed in 2019. We are looking forward to sharing our space for the first year with South Bay as they need a temporary home for their new boat dealerships and ships store. Its a good fit, and we look forward to the shared traffic that all our endeavors will create. We still have 5 boats that are in storage that need to be finished and sold once our 25’ Heir Island Lobster boat is moved out for paint in March. All of this is happening in a 30x40 room in the back corner for housing our long term boat builds and machinery. Our Saw Stop Table Saw should be installed in the first couple of months of 2019, and Uni-Strut will line the west wall to help us clear up floor space for more machines and cleaner and safer workspace. We are still in need of 4-5 stationary tools to be a fully functional production wood shop. We are looking at 8-12” Jointer, 20” Throated Bandsaw, 15-20” Surface Planer, and a large capacity Cyclone Dust Collector with the lowest decibel level possible. The machine room has metal walls, and we are doing what we can to cut down on the noise level inside the room. We are placing an emphasis on certification training for our mentors and apprentices starting in 2019.Even though our student classes start with hand tools, a portion of our long term revenue needs will be supplied through a machine room with stationary power tools. Patrick Molzahn, head of the cabinet making program at Madison Technical College, has already certified Mark Hawkins as a Skill Evaluator. Starting in 2019, all of our mentors will be trained and certified through the Woodworking Career Alliance (WCA). Thanks to the WCA training, our new heated shop at 101 Bay Beach Road will be a safer place to build boats and train future generations. Woodworking students are the future of our industry, and we all recognize how important it is that they be trained properly. One of the great advantages students have who participate in the WCA is that they can earn a credential based on the same standards used by industry. This gives students pursuing a job in the woodworking industry after graduation an extra boost to their resumes and differentiates them from the rest of the crowd. The difference is they can prove their competence on each of the tools because they were observed and evaluated by their instructor who has been trained as an Accredited Skill Evaluator (ASE) by the WCA. 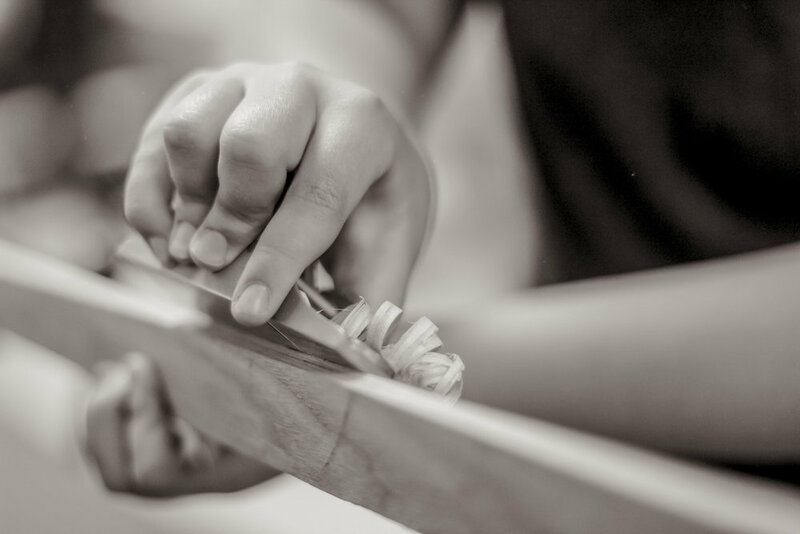 Hand tools are magic for kids of all ages, and Hands On Deck just sets the stage. If you look a our society, you will see that there is no room for process. Everything is beginning and end with no middle. CNC machines process your ideas so you can enjoy a final product, or Amazon sends you what you want today or tomorrow so you can get bored with your new widget even faster! We consume veraciously thinking we are saving time, but what are we saving time for? If I could do anything right this minute, I would be in a circle with a group of 12 year olds...showing them how to make chopsticks or butter spreaders out of Birch with a sharp carving knife. Carving chopsticks and butter spreaders out of fresh cut White Birch forces you to slow down and enjoy the minutiae of the process. You don't want to rush it...its enjoyable...and you want to do a good job. Its just you, the knife, and the wood...a pretty fantastic combination. All woodworking is essentially the same concept...you, a knife of some sort, and the wood. Anything that removes wood has a edge, that should be sharp, to do the cutting and removing. Sometime you use blunt wedge to split wood, but its the same idea. Human, steel, and wood. Working with hand tools that do not require electricity is an organic process to any human, we just have to rediscover it...and for a 12 year old...it comes naturally. The Mackinaw boat as a distinctive type dates back to the early 1800’s. It was the “pickup truck” of Lakes Michigan, Huron and Superior for over a century. Though size ranged from 16 feet in length to over forty, the average was 26 feet in length, 8 foot in beam and drew about two feet of water. Characteristics included a plumb stem, raked stern post, strong sheer and beam carried well forward. The majority were two masted—ketch or schooner rigged—with a bowsprit and foresail. As the photograph of the Seang testifies, the Mackinaw was a beautifulsight on the water! The craft were sturdily built and their hull shape provided a safe and stable platform for fishing and the efficient transport of goods and people. They were noted for their speed and seaworthiness. The French, the earliest large European presence active on the Lakes, developed close associations with First Nations peoples. Brought together by exploration and the fur trade, the two groups probably used their extensive experience with the Indian freight canoes to establish the “template” of what later became recognized as a the Mackinaw boat. Already accomplished in woodworking, Native peoples quickly learned how to incorporate this skill set into European boat building methods and capitalized on the demand for these boats. As a result, many of the Mackinaw boats in use on the Upper Lake were built—and asignificant number owned—by First Nations people. Fast forwarding to 2017, Hands on Deck took on a custodial role for the Serang. 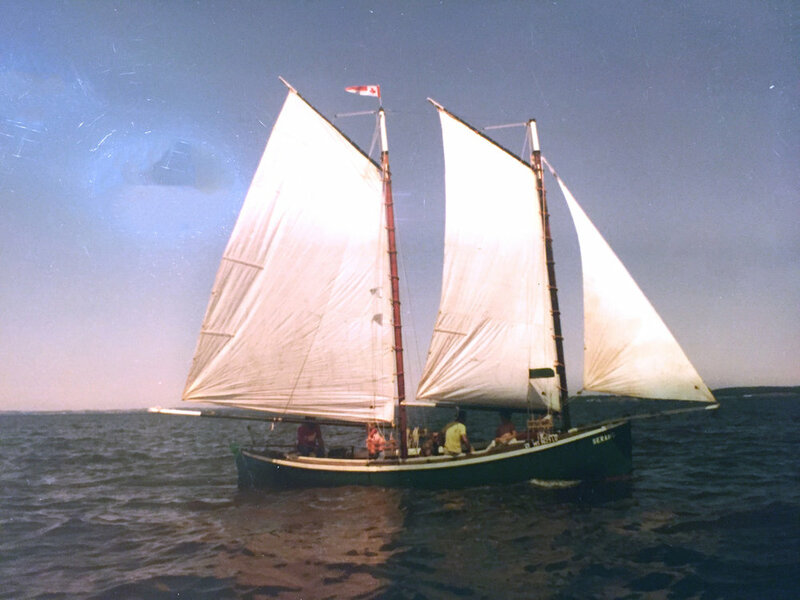 She is a 27-foot Mackinaw boat built on Manitoulin Island on Lake Huron in thethe early part of the 20th century. Serang is past the point of being a candidate for a full restoration but we are researching her background, have recorded her dimensions and will be making her lines and construction details available in 2019. And, who knows, we may evenbuild a sister ship some day. As of the Fall of 2018, SERANG’s lines have been taken by Rodger Swanson and Pete Matcheffs, and she has been moved into a permanent home in Two Rivers at the Rodgers Street Fishing Museum. We are continuing our efforts in experimental archaeology with smaller Mackinaw Boats at this time.